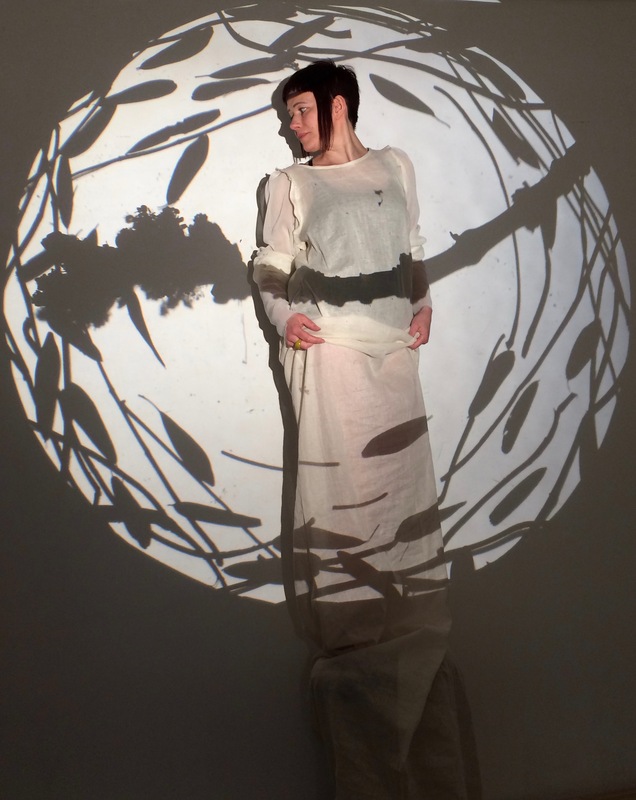 As a socially-engaged performance artist, Jo uses immersive, experimental techniques to engage audiences and participants. Her work encourages a deeper connection and understanding of specific environments/heritage/aspects of ’ourselves’ in relation to our community and the natural world. Drawing from her experience of working in youth services and adult substance misuse services; Jo is interested in how we see and interact with a place and how this influences our relationship to it, our own identity and our relationship with others. As part of the re-seeing of spaces, she often uses projected images and interaction with them to create fleeting, manipulated forms. Shadows and the interplay between light and dark also reference her interest in Jungian theory and the process of psychological transitions. Image: research for Ode to the Ash Tree (managed by Courage Copse Creatives in association with Arts Council England. Collaboration with Chalkblack, Courage Copse Creatives and Shimnix film production). As well as focusing on specific solo projects Jo works with youth projects, schools, multi-generational groups, women’s projects, mental health services, substance misuse services, home education groups and special needs projects. Working predominantly in outdoor spaces such as woodlands, coastal locations, public spaces and festivals over the past four years; Jo often applies large-scale projections created using organic materials to form striking images with which the participants interact. She has adapted her processes to include sustainably sourced off-grid technology in order to take her participants out into the elements and wild spaces. Her work is often site-specific; working with partner agencies and in collaboration with other artists, film makers, dancers, photographers, actors, storytellers, historians/museums, youth workers, musicians, psychologists, woodlanders, environmental experts, 3D makers and festival entertainment/event organisers. Jo is a registered artist with DAISI – Devon Arts In Schools Initiative. DIY WORKING GROUP/BURSARY – an independent gathering of arts organisations and arts practitioners who meet regularly to advocate for the sector and to discuss and inform policy, as well as forming working groups in response to specific issues and to develop shared activity. This thinking feeds directly into the wider cultural conversations happening at a high level in the city through the Cultural Strategy Steering Group. WHEN PAIN MEETS ART/COLLABORATION/PERFORMANCE – exploring the relationship between long-term pain and art; collaboration with Hal Camplin; inviting artists with experience of long-term pain to join the ‘conversation’ leading to collaborative work/works. MENTORING FOR RESIDENCY PROGRAMME/KNOWLE WEST COMMUNITY – approached by Knowle West Media Centre to mentor two recent graduate (SW Graduate Photographer Prize winners) throughout their first major community residency (8 weeks). Working with archive and developing new material to tell the story of Filwood Broadway- the architecture, the social history, the personal histories. Working with local residents to gather stories and material. Developing material to be shared with the community and form content for an exhibition, including site specific and outdoor display. Advice, guidance and inspiration shared with the SWGPP to potentially expand their practice into other disciplines through the use of mediums such as projection, textiles, performance etc. On call throughout the residency to offer guidance/advice. ASH/FILM/PROJECTION/PERFORMANCE- The Ode to the Ash Tree project – artist led community project, research into the cultural significance, myth, uses and potential demise of the Ash tree population in the UK due to the spread of Ash Dieback and development of site specific performance and off-grid projection techniques (managed by Courage Copse Creatives in association with Arts Council England. Collaboration with Courage Copse Creatives and Shimnix film production – 6 month project). AN INVITATION TO THOSE WHO FIND THEMSELVES AT A POINT OF CHANGE IN LIFE AND WANT SOMEWHERE TO MARK, LEGITIMISE OR PROCESS THIS. IT IS ALSO AN INVITATION TO THOSE WHO MAY FEEL A SIGNIFICANT INTERNAL SHIFT (MAYBE IN A PERIOD OF DEPRESSION OR ANXIETY) BUT CANT NECESSARILY IDENTIFY WHAT THIS IS OTHER THAN REALISING THAT THEIR PREVIOUS WAY OF FUNCTIONING ISN’T WORKING FOR THEM ANYMORE. HIGH NOON GIVES SPACE AND FORM TO THIS PROCESS AND RECOGNISES DIFFERENCE AS WELL AS COMMON THEMES OF LIFE TRANSITION. HIGH NOON ISN’T A TALKING THERAPY BUT AN ART PROCESS THAT DRAWS ON OFTEN DISUSED WAYS OF SEEING AND BEING; WHICH HELP WHEN ACCLIMATISING TO THE UNFAMILIAR TERRITORY OF CHANGE. THIS TWELVE-HOUR EXPERIENCE OFFERS A SAFE SPACE FOR INDIVIDUALS TO JOURNEY WITH OTHERS THROUGH THIS PROCESS IN A SMALL GROUP SETTING (max 6) IN A PRIVATE WOODLAND SETTING – STARTING AT MIDDAY AND ENDING AT MIDNIGHT. The work is influenced by the theories of depth psychologists such as Carl Jung, Thomas Moore, Clarissa Pincola Estes and James Hollis alongside writers such Sharon Blackie and Mary Oliver, wilderness guides such Bill Plotkin and Martin Shaw and artists in the Social Sculpture discipline such as Joseph Beuys and Shelley Sacks. Since the summer 2016, much of the work has involved working with women in a rural setting. Jo is now collaborating with psychologist Jonathan Stott in order to develop a stronger psychological base for the process and, together they are developing High Noon to include any gender and to provide urban opportunities for people to become introduced to the idea of ‘marking transitions’. An exhibition/event exploring the work and themes of High Noon was recently shown at the Create Centre, Spike Island, Bristol from 12/05/18 until 23/05/18. Due to requests for more, similar opportunities in urban settings; High Noon will be running further events in the coming year as well as the ongoing High Noon – Woodland events. See ‘High Noon – Woodland’ and ‘High Noon – Events/exhibitions’ for further details. Jo is a Bristol-based artist who moved to the city in October 2015 having spent 7 years living on the coast in North Devon. As location and landscape is an important part of her work – the name ‘Chalkblack’ referring to the geology of her home town Portsmouth where exposed areas of chalk greet those arriving along the coast line, and the geology of North Devon’s Atlantic coast line where Bideford Black can be found in coastal rock formations. Chalk and Black represent the geographic and psychological transition she made leaving one place for another. She often uses these materials in her work for this reason. She is registered self employed as an artist and performer, has a current DBS certificate for working with vulnerable adults and children and has public liability insurance. Jo has a network of creative contacts across the UK who she is able to bring onboard for specific projects that need specialist knowledge and experience.